You might ask what becoming an “older adult” has to do with a road trip. Not much with the physical aspects of the trip. However U.S. citizens who turn age 62 may purchase a federal Senior Interagency Pass for $10, and it is good for the rest of one’s life. It entitles you and your party to free admission at all national parks and other federal units admitting visitors for a fee. You also get 50% off on camping and many other fee-based activities. So typically, we were paying $10 per night to camp in federal campgrounds. Compare this to the $38 per night we were paying on the California coast in August (where most public campgrounds are state and local). So we could afford only a week in California but managed nearly three weeks driving through the heart of the American West. Our 3,500-mile (5,633km), 19-day road trip was basically spur of the moment. 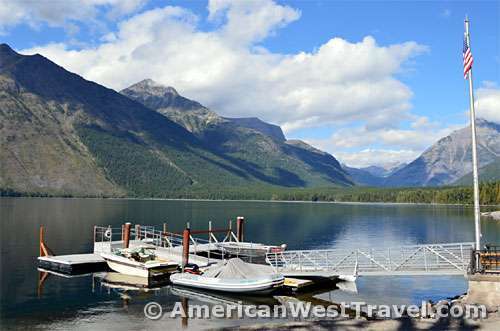 While casually browsing the Internet in August, we discovered and jumped on a cancellation at the famous Granite Park Chalet, a wilderness walk-in hostel in the heart of Glacier National Park (aka the Crown Jewel of the Continent). The chalet is accessed via the 7.6-mile (12.23km) Highline Trail (aka the most scenic trail in America). Both the chalet and park celebrate their 100th anniversary in 2014. The long road trip was certainly made possible by our switching from tenting to staying in the back of a pickup truck which has a small shell (a cap) and a carpet kit. It is far easier to make daily stops when you don’t have to spend a large amount of time setting up and then breaking down a tent, and then stowing all the gear. Further, we realized our driving limit was about 400-450 miles (645-726km) in an eight hour day including stops. As Glacier National Park is over 1,300 miles (2,092km) from Scottsdale, Arizona, it was going to be a nice long road trip with lots of stops. Below is my journal for this trip. September 1 (Day 1). Our reservation at Granite Park is for the evening of September 5. Therefore we’re allowing four days for the drive up to Montana and have to start our trip on Labor Day. Fortunately the heavy holiday traffic should be returning towards the city. We head straight north to Red Canyon in Utah, a few scenic miles down the road from Bryce Canyon National Park. It did take almost exactly eight hours to drive the 420 miles (676km) with stops. 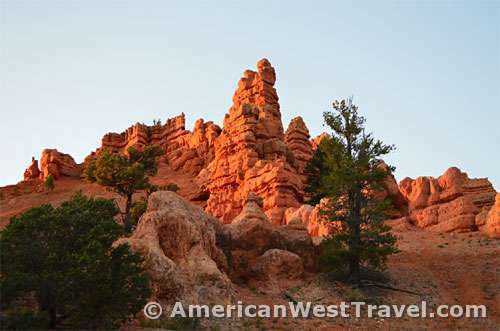 Red Canyon is part of the Dixie National Forest and features red sandstone scenery quite similar to Bryce Canyon. Also, an excellent campground with very large wooded sites, showers, flush toilets, etc. This was my first use of the senior card, netting me a site for $7.50. September 2. We get an early start as we have to drive through the Salt Lake City metro area later in the day, and that is always difficult. After an exciting climb to a high mountain pass on Utah-20, we reach I-15. The segment from here to Provo is mostly through open desert and ideal for those who want to put the pedal to the metal on an open, lightly traveled road. The speed limit is 80mph through the flat, open areas. Our plan is to detour slightly into far western Wyoming where I am aware of convenient and inexpensive National Forest Service campgrounds. This allows us to leave the interstate at Provo and avoid the traffic horrors of downtown Salt Lake. The Provo Canyon route (US-189 east to US-40) offers scenic driving and far less traffic. The route climbs above the dam and follows along scenic Deer Creek Reservoir with snow-capped mountains rising in the background. After passing Heber City the route climbs steeply and hugely up to the ski resort of Park City. The mountains are showing signs of early fall foliage. Apparently, the campground closed officially on Labor Day. The envelopes and price sign were removed so we stayed for free. September 3. It had drizzled a little during the night, and the morning temperature was in the 30s°F/2°C. So we decided to pack up and find a restaurant for breakfast. As always, I told Gerry my preference was a restaurant with the word “country” in its name. Sometimes it works out. North of the campground, Wyoming-89 is a bit busier as it heads towards Jackson through the Star Valley. There are small, well-kept towns along the way, some with services. The town of Afton had a real downtown and numerous services but the street was being repaved, making it difficult to stop. It did have a “Country Inn” but it was a motel and not a restaurant..
A little further north, the village of Thayne had been completely and seemingly recently remodeled and had the look and feel of a modern strip mall. We caught a glimpse of a log building behind a gas station with an “open for breakfast” sign. This turned out to be Tootsie’s Restaurant, a two-store chain, the other location being up the road in the town of Alpine. It seemed to be pretty locally authentic, as it had a large sign inviting patrons to bring their firearms into the restaurant. (I didn’t see any customers actually packing.) They did have a fine breakfast menu, and we both had their excellent special omelet. Continuing north we noticed numerous poles (like wooden telephone poles) with platforms at the top in the meadows to the left of the road. Soon we noticed nests in some of them, and that the birds were bald eagles. Apparently they are meant to attract the eagles away from the power lines and their poles, many of which also had bird nests at the top. At Alpine, we turn onto US-26 west into Idaho in order to return to I-15 at Idaho Falls. After some very scenic driving around Palisade Reservoir we enter Swan Valley through which the Snake River flows. This is a somewhat slow route as they are several towns and small-scale tourism: cabins, small lodges, RV parks. As we head towards Idaho Falls, the weather begins deteriorating with extremely heavy and steady winds making it hard to drive. Further, the route through Idaho Falls is congested with a main commercial strip and endless traffic lights, with no signage indicating how to reach the interstate. Wouldn’t take this route again. Finally, we get back on I-15 north and hit the open road: few cars, no trucks, high speed limit, and beautiful country. Also, many miles between each exit. Our break came at Dubois, Idaho which consisted of a modern rest area (with free wi-fi) and a travel plaza. We’d seen a number of such travel plazas in remote areas on this trip. They offer complete travel services under one roof. Some are enormous complexes serving truckers and trucks as well as ordinary travelers. We luck into a pretty decent hamburger. And an observation driving through Idaho: hunters sure seem to like wearing camouflage gear. We’ll spend about four hours on the freeways before heading off the beaten path again. Much of it was very lightly traveled with beautifully rolling hills and countryside. The driving was made uncomfortable with the constant high winds. There is somewhat more life as we enter Montana as there are more towns. Soon we switch onto I-90 west where there is immediately more truck traffic. At Garrison, we leave the interstate to reach Seeley Lake, our goal for today (leaving about 100 miles (161km) to reach Glacier). The last eighty miles (129km) were virtually nothing but nature and threatening weather. We lucked out on the campground. The first one we tried, Big Larch, indicated that it closed after Labor Day. You could camp – but no drinking water and no trash pickup. It had been raining some, and the place was soggy, uninviting, and empty. We decided to try Seeley Lake Campground on the other side of the lake. This was much nicer (flush toilets, sinks, paved sites). They were staying open a few more days to celebrate the 50th anniversary of the Wilderness Act. Plus, there was no charge as they technically closed after Labor Day.